Arrive in Prague and check into your hotel. 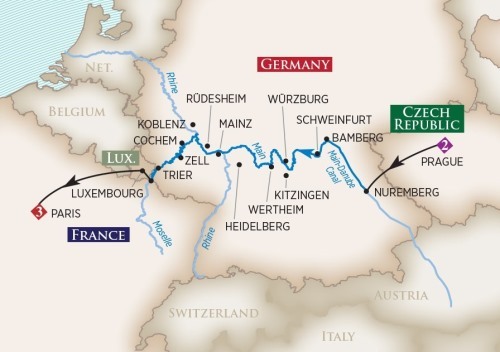 Two iconic cities, Prague and Paris, bookend this perfect journey that combines three beautiful rivers, the Rhine, Main and Moselle, into one grand adventure. Cruise past historic vineyards and imposing hilltop castles. Discover how everything in Zell centers on the “Black Cat” and how it relates to wine, and learn the secrets of Trier’s Porta Nigra. Let the storybook villages of Rüdesheim, Wertheim, Bernkastel and Cochem captivate you. All along the way, enjoy Europe at its most picturesque. Single Supplement for Cruise: 50% of twin price & Suites 100% of twin price.